سواءً كنت مسافراً بغرض السياحة أو العمل, Pension Paparara Dive and Lodge هو خيار عظيم للإقامة خلال زيارتك فاكارافا. يقع الفندق على بعد 0.6 Km من مركز المدينة، ويؤمن الوصول إلى أهم مراكز المدينة. يوفر الفندق بفضل موقعة الجيد وصولاً سهلاً إلى أهم معالم المدينة.
. يعمل Pension Paparara Dive and Lodge على ضمان إقامة مريحة لضيوفه من خلال خدماته الممتازة وحسن ضيافته. يمكن لضيوف الفندق الاستمتاع بالميزات التالية على أرض الفندق: تسجيل وصول/خروج سريع, تخزين الأمتعة, واي فاي في المناطق العامة, صف السيارات, خدمة الغرف . استمتع بوسائل الراحة الراقية في الغرف أثناء إقامتك هنا. بعض الغرف تتضمن إغلاق, مناشف, بياضات, اتصال لاسلكي بالإنترنت, اتصال لاسلكي بشبكة الإنترنت (مجاني) لمساعدتك على استعادة طاقتك بعد يوم طويل. يقدم الفندق مجموعة رائعة من الخدمات كمثل شاطئ خاص, غوص, صيد السمك, حديقة, رياضات مائية (غير آلية)، لجعل إقامتك تجربة لا تنسى. إن Pension Paparara Dive and Lodge هو مكان مثالي للمسافرين الذين يتطلعون إلى الراحة والاستجمام في فاكارافا. The pension is rustic, and you will sleep under mosquito netting, but the customer service is excellent. Corinna and her crew took exceptional care of us. Our rooms were cleaned and the beds made on our second day. Our cost included breakfast and dinner. The dinners were excellent. They were homemade and made with fresh ingredients. I wish I could take those dinners with me on my travels. I like a modern setting (you won't find me camping), but I quickly got used to Paparara's setting; the common area with free wifi helped a lot. Corinna even took time out of her busy schedule to take one of my travelling companions to the medical centre. One day, as we emerged from snorkelling, my friend and I were called over and took part in a lesson on how to make coconut bread. This type of customer care is what made this one of the best locations during my travels in French Polynesia and Australia. My only regret is that I did not get to meet Ato (Corinna's husband). 02 dive people were great! Very peaceful, beautiful lagoon, fantastic dinner, perfect location, nice trip to "Lagon Bleu"
I really enjoyed staying at Pension Paparara, Corinne and Jimmy were great hosts and sorted everything out during my stay. The bungalow is right on the water so you will fall asleep to the sound of lapping water on the beach right on your doorstep. Food was exquisite and you will not be hungry. There is also opportunity to do all the tours available on Fakarava, and I would not hesitate to recommend staying. Very basic bungalows,no warm water, masses of mosquitos, close to a very nice dives center (Dive Spirit Fakarawa), pricey for what it is ..
M'y stay sas OK, the hotel location is great and the staff friendly, my main criticism concerns the room which was very small and not comfortable (separate bathroom, broken chair, limited lighting, etc.). I feel that I overpaid for the room (bungalow) I got. 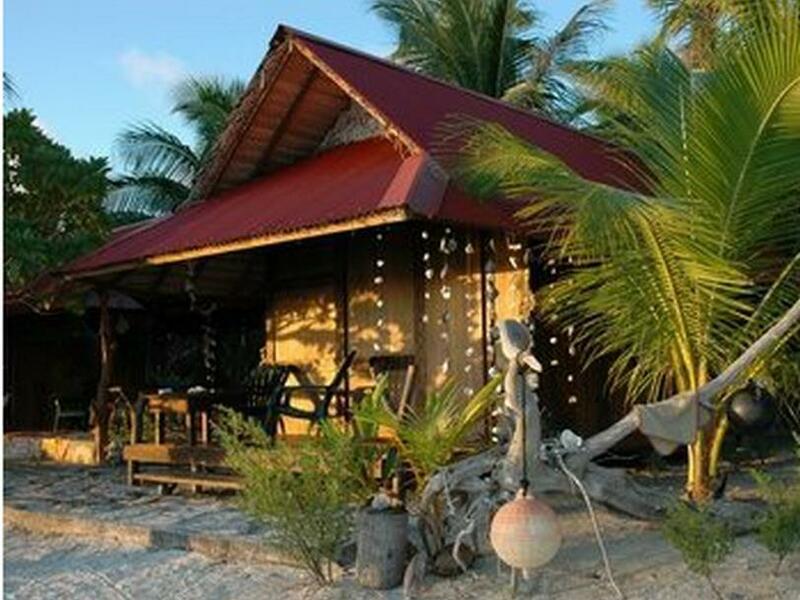 There is a dire need for a good hotel in Fakarava. beautiful bungalow with lagoon view, but with opened interior (mosquito net over beds included), remote location, not possibility to move without car or bike, very good home-made food but without possibility to choose menu and no drinking water or boiling kettle provided by the hotel, activities possible, but dependent on sufficient number of participants, overall relatively expensive for what is provided. The host couple Ato and Corinna could not be nicer and more helpful, but our cottage could be called rustic at best, with the creature comfort limited to 24 hr electricity and running cold water, and mosquito netting over the bed. The food prepared by our hosts was excellent (rich breakfast, 3-course dinner every day), and Ato or Corinna drove us to town or the airport when asked. As fairweather snorkelers we did not join Ato on one of the excursions he offered, since due to the incessant stron wind even the lagoon was quite choppy with white-caps. Simple, picturesque, on the beach. The owners, Ato and Corina, were very friendly and informative, the food was good, and eating meals with the other guests (all Francophone) was a very useful way to get my French back up to speed! Il serait nécessaire de préciser à l accueil le prix des repas du soir qui ne sont pas compris lors des réservations. Nous avons eu un temps magnifique et surtout un très bon accueil, merci à la pension Paparara Dive & Lodge et merci à tout son staff. Bon séjour. Le gros point fort de la pension est son cadre, le lagon et les bungalows. Les repas sont limites en terme de quantité mais corrects. Cependant on a vu mieux en terme d'ouverture et de possibilité de discussion avec les proprios. Comfort limité mais vu qu'il n'y a pas d'hôtel sur cette île. C'est certainement une des meilleures adresses disponible. l'emplacement,le look des bungalows, la plage et le poulet aux petits légumes d'Annie. merci à annie qui par sa gentillesse a contribué à trois jours paradisiaques. on retiendra, le bungalow en première ligne face au lagon avec son coucher de soleil et les plongées dans la passe nord.